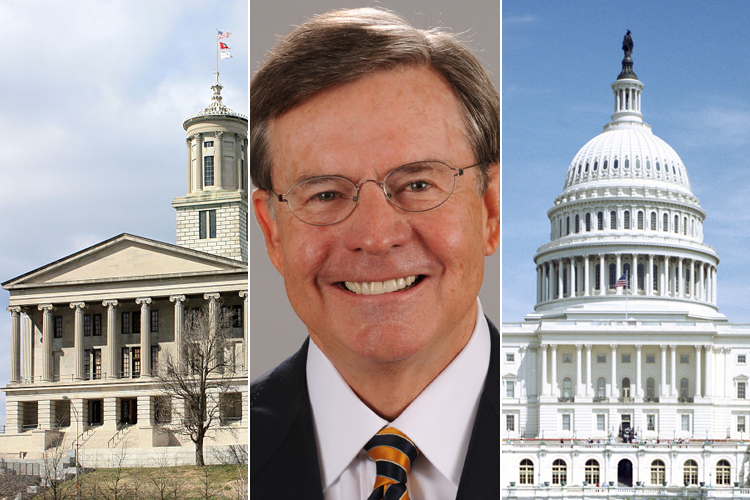 MTSU employees pledge record $..
An MTSU alumnus whose political career has taken him from Tennessee’s capital to the nation’s capital will return to campus Nov. 13-14 to share his experiences. Jim Free will join Dr. Louis Kyriakoudes, director of the Albert Gore Research Center, in a discussion during Kyriakoudes’ “Southern Politics and Policy, 1890-2000” class at 4 p.m. Monday, Nov. 13, in Room 219 of Peck Hall. Free also will help Kent Syler, an assistant professor of political science, teach two sections of “Introduction to American Government and Politics” on Tuesday, Nov. 14 at 9:40 a.m. and 2:40 p.m. in Room 211 of Peck Hall. Free also will join Syler’s “Political Campaign Management” class Tuesday in Peck 211 for questions and answers beginning at 4:20 p.m. The public is welcome to attend all Syler’s classes, but seating will be limited. Free earned his bachelor’s degree in political science in 1969 and his master’s degree in public administration in 1972, both from MTSU. After graduation, he served as the university’s director of admissions and later became a vice president’s assistant at the University of Tennessee. Free, who served as an administrative assistant to Ned McWherter when McWherter was speaker of the Tennessee House of Representatives, eventually rose to chief clerk of the House. In 1977, he was hired as special assistant for congressional affairs to President Jimmy Carter, advocating Carter’s positions on transportation, trade and environmental issues. Beginning in 1981, Free spent the next three decades representing major global companies in areas such as energy, entertainment, communications, health care, financial services and transportation for two consulting firms. The Columbia, Tennessee, native and his wife, Ann, continue to support his alma mater by establishing the Jim and Ann Free Endowed Scholarship in Music Business at MTSU. His professional papers and a video oral history will be housed at the Gore Center. A campus parking map is available at http://tinyurl.com/MTSUParkingMap. Off-campus visitors attending Syler’s classes should obtain a one-day permit from MTSU’s Office of Parking and Transportation at 1403 E. Main St. or online at www.mtsu.edu/parking/visit.php. For more information, contact Syler at 615-898-2708 or kent.syler@mtsu.edu.